Previous to April 2013, public health teams largely contributed to commissioning in terms of helping to establish needs and priorities (at the start of the commissioning cycle) and with the evaluation at the end of the cycle. Often, public health teams were involved in monitoring KPIS in contracts with community providers or acute services providers. However, since April 2013, many public health teams have found themselves also being commissioners or their teams now including public health commissioners. Much of this new commissioning work involves contract management, budget lines and invoicing and this is a new competency for public health consultants and managers. Commissioning is the buying, weighing up of cost-effective ways of delivering something and inspiring someone to look after health and well-being differently. In our personal lives, we have all been involved in commissioning - e.g. when going on holidays, we may go on a website and weigh the different holidays available for our budget and which one offers the best value for our limited funds. All commissioning in NHS is covered by the 2009 Procurement Regulations and encompasses the ideals of corperation and competition - i.e. best value for money, testing the market and getting the best cost-effective service to fit the market. The Corperation and Competition Panel regulates commissioning in England. Throughout the commissioning cycle, public health skills are needed in the planning (needs assessment, review of evidence, deciding priorities), designing and procuring services of a high quality standard and finally, by managing performance, monitoring quality and evaluating service provision. Agree how and where to purchase. Monitor performance of providers against agreed contracts. Health authorities setting up contracts with hospitals will need to decide between different services and which should have priority. In Health of Nation, Department of Health set up the principles for the development of services (1) effectiveness (2) efficiency and (3) health improvement. You will need to decide between values of high quality or cheapness or compromise. To commission any service, you need the element of a perfect market (i.e. many buyers and sellers, free entry and exit, homogeneous product, perfect information and no externality (i.e. I pay and someone else benefits). For specialist commissioning (this is for rare conditions e.g. for haemophilia or chronic kidney disease, specialised cancer services, motor neurone disease etc), you will also need to consider insurance, high costs, whether or not population demand is predictable and whether an individual's probability of demand is independent. 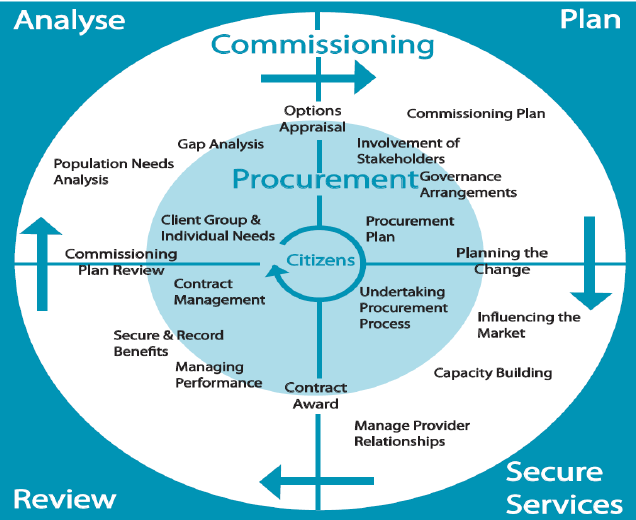 Commissioning services is based upon Bradshaw's 'Need, Supply and Demand' model. Balancing demands and need requires a set of values upon which health services provision can be based. There are a number of factors that influence the quantity of services needed. These are disease incidence and prevalence including 'new' diseases (Incidences and prevalence measures do not automatically provide a measure of 'need' for health care); Medical technology and other pressures such as public opinion, politicians, press, voluntary groups and community health councils. 1. Commissioning starts looking at feedback, audits, needs assessments, national service specificiations, NICE guidance etc to inform this year's commissioning strategy and intentions. This can involve putting together a business case using activity out-turn, cost card and population growth. This may include noting cost pressures. 2. If there are to be changes to the contract - this will be a variation to contract and will require 30-90 days notice. All NHS contracts usually last 3 years but can be extended 12-24 months. Alteration to service specification will need agreement by both parties (commissioner and provider). Directed Enhanced Servies and National Enhanced Services run for 3 years and don't need signing each year. 3. Sometimes you need to decommission a service and this will require 90 days notice except when in the first 24 months of a contract, where 12 months notice is needed. The notice letter to the provider comes from the CEO. Once decommissioned, there will need to be a closure plan with provider and clients. If the service is to be recommissioned, a procurement strategy and plan is needed (this is the same for the commissioning of a new service). Any contract that is over £173,000 per annum must have competition in tendering but Legally, you don't have to procure for amounts under £173,000. Single Tender Action can be cited. Single tender action restricts procurement to any qualified provider that can deliver this service. Used if small monies and short timeframes. You can skip PQQ1 and PQQ2 stages of the pre-qualification questionnaire. Since 2010, tendering uses delta portal which outlines all expressions of interest, pre-qualification questionnaire and invitations to tender. Every tender over £300,000 appears on Delta Portal. Procurement can take 90 days. 4. Performance Management - if KPIs are not met, you ask for an action plan within 30 days. If this plan fails, then you opt for remediation (i.e. tell them to do something by a certain time) and if that fails, it is a breach of contract. You serve a breach (usually means taking money off them). As a public health commissioner this is about balancing what should be (clinical gold standards), what is value for money (commissioner organsation viewpoint) and what is the best you can do with the resources you have ('good enough for the tax-payer). Cost-effectiveness and cost benefit anaylses are useful tools to have. This has been in operation since 2003. Prior to that, block contracts were awarded to acute trusts (and mental health trusts) to provide services with prices based on historic local costs and negotiating skills. It was difficult for commissioners to see what outputs actually cost and to identify and deal with inefficiency by the provider. With payment by results (or really it is payment by activity), there is a set tariff per activity and income is generated by the provider by simply multiplying the price by activity. Pricing is determined through classification (i.e. a system of codes is used to record clincial diagnosis and procedures in a standardised way), currency (i.e. codes are grouped together on the basis of clincial and financial similiarity to provide standardised units for payment knowns as health resource groups) and costing (i.e. there is a standard price allocated to the health resource groups on the basis of the reported cost of provision across the acute sector). Payment by results has helped to strengthen commissioning. You can monitor provider activity and performance and can now focus on demand management. This was first raised in the NHS Operating Framework (2006/7) and was used as part of practice based commissioning which then became CCG commisisoning. Under the NHS Operating Framework, demand management was said to consist of three components. Firstly, practice based commissioning was said to be an effective demand management measure as it ensured that all GP practices have the incentive to control referrals and other use of services. This freed up resources which could be re-invested to improve services. Secondly, commissioners could have provisions in contracts with hospitals, for instance, having expected clearance times for existing waiting lists, to help demand management and finally, there should be monitoring arrangements. CCGs and acute trusts should have joint responsibility for agreeing measures to deal with significant variance from plan, for example, freeing up resources for redeployment when activity is reflecting changes in patient choice or if there is a genuine unexpected increase in demand for a service. Public health have been involved in some places in reviewing the referral process and pathways (including appropriateness of GP referrals and making consultant-to-consultant referall pathway more effective), reviewing treatment times, helping to develop primary care provision points instead of A&E where possible and helping to develop effective case management by communicating and installing best practice guidance. In 2011, QIPP was developed as part of world class commissioning proccesses under the then Labour Government. The idea was to give PCTs the skills to be at the forefront of delivery improvements to all parts of their local population using principles of QIPP (Quality, Innovation, Productivity and Prevention). World Class Commissioning may have ceased but QIPP continues to be used today with all NHS organisations - providers included - devising annual QIPP plans to demonstrate efficiency and value for money. CQUIN stands for Commissioning for Quality and Innovation. Under a CQUIN, you can earn up to 2.5% of contract value - usually 12months long. It is used to upscale and uplift a service above and beyond service delivery. A defined service area which makes up one geographical service area within London.